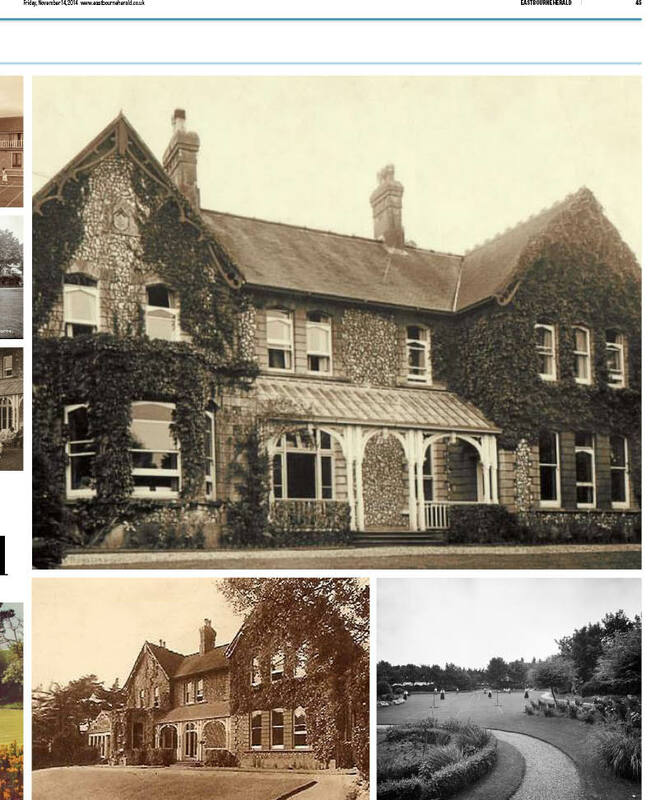 Picture of the Links School, including lawn tennis courts and ladies lounging around. Also article about me! People who read this blog will recall that last November I went to south-East England to conduct an interview with BBC Sussex and Surrey and meet Sheila Bugler and her friend Annemarie Field of the Eastbourne Herald. 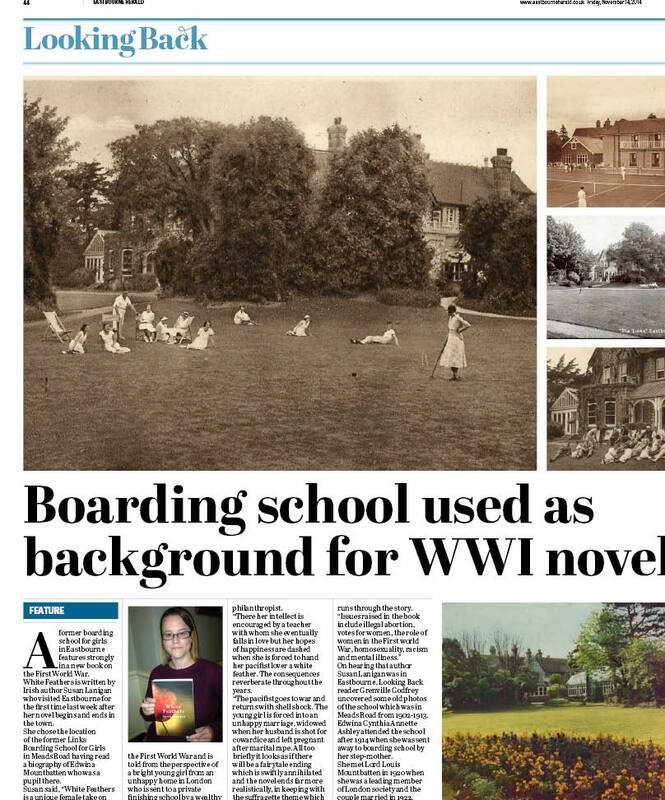 We met for meal and drinks in Eastbourne and I mentioned that the school to which Eva is bequeathed a scholarship was based on a real one I’d read about in a biography of Edwina Mountbatten. (My mother was interested in Lady Mountbatten and bought the book and lent it to me, I think. Edwina Mountbatten was…umm…something else. But anyway.) Edwina attended a finishing school called The Links in Eastbourne and when I was writing White Feathers, it became the first name that came into my head. I remembered a picture where she and a few other pupils were standing around in a circle holding hands and this put the name “links” more firmly into my head. Once I mentioned this, Annemarie pulled out her phone and facebooked local historian Grenville Godfrey, asking him if he could locate The Links. Mr Godfrey came back with a picture of a building on Meads Road, “but it’s probably gone now”, he added. The following morning, after a pleasant overnighter at the Ravilious Guesthouse, I took up a walk up Meads Road which happened to be just around the corner. I ended up walking all the way up the hill to Beachy Head, but on the way I was looking out for buildings that might bear a resemblance to the brief shots I had seen. There was one that I thought, “if it were to be like any building it would be this one.” The building looked institutional, but it was an old house with a trellis at the side and an elaborate greenhouse. The Links is now called Wellsmead and converted into flats. Michael Ockenden of the Eastbourne Local History Society wrote a fascinating article about the house in the society’s newsletter no 74, and Michael Holroyd acknowledges his help in his autobiography Basil Street Blues – his great-grandfather lived there. Hi Elizabeth, thank you for letting me know, and welcome! I never imagined I would happen on that very building while I visited Eastbourne, and walk up the driveway of the real place I inadvertently set my fictional story. I just remember reading a bio of Edwina Mountbatten and seeing a photograph of her there as a student and it was the first place that sprang into my head. I was so lucky to stumble upon it.